Wholesale Trader of a wide range of products which include crucibles set. 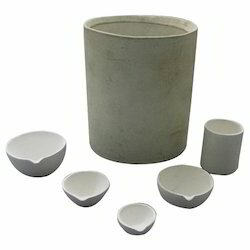 Being a noteworthy organization, we are committed to manufacture strong and sturdy Crucibles Set. Our products are available in different sizes and specifications as per the demands of customers. Using finest quality cast iron, we manufacture our products in conformation with set industry standards. Our squad of quality experts checks the construction, dimensional accuracy and finish of our cast iron crucibles before dispatch. The verified range is packed and dispatched to clients across the globe. Dia.mm / Cap "THIASIL" "INFUSIL"
Looking for Crucibles Lids Basins ?